The Irish music scene continues to produce a constant and ready supply of earnest and undoubtedly talented singer-songwriters. There is an argument to be made that we have reached saturation point – the market for troubadours clutching battered acoustic guitars and dog-eared notebooks crammed with heartfelt lyrics is bursting at the seams on this small island. Sorting out the wheat from the chaff can be difficult – it all begins to sound like a seriously intense overdose of sincerity after a while. To her credit, there has always been a little bit more to Wexford born Wallis Bird than that. She may have been nurtured by that scene in the early days, but her last album seemed like a serious attempt to forge her own unique identity, to move away from the claustrophobic and somewhat incestuous local scene. Architect is her fourth album and by some distance, her loosest, least self-conscious sounding record to date. It sounds like the shackles of the ‘earnest singer-songwriter’ tag have been cast aside for a more nimble and funky version of the Bird of previous records. There’s a freedom in the euphoric ‘Hardly Hardly’ and the lithe and dexterous ‘Daze’ that we haven’t seen before; while not quite a dance record, it definitely has moments that might induce a little hip grinding. There is a strong hint of Talking Heads on some of these tracks, never more so than on ‘Girls’, while the rollicking ‘Gloria’ with its high octane beat sounds like it could have been a credible contender for Eurovision glory in Copenhagen next week. We are in more sober territory with standout track ‘Hammering’ and beautiful album closer ‘River of Papers’. Architect represents a bold move for an artist who has reached something of a crossroads. With four albums under her belt and having built a loyal and established fan base, the temptation to settle into a comfortable groove and keep churning out different iterations of the Wallis Bird sound is always there. 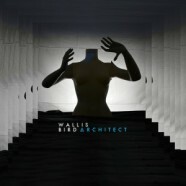 Architect demonstrates that Wallis Bird is not prepared to stand still – it is the sound of an artist striving to change and grow and have a little fun along the way.